Is its Option 1 package slowing down online video streaming? 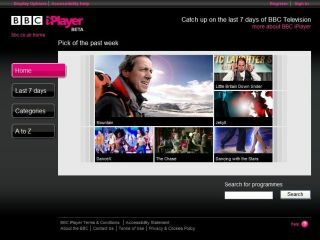 The BBC has accused BT of throttling its iPlayer service for those who are on the telco's cheap Option 1 package. On its dot.life blog, the BBC states that one of its employees was concerned that when watching the iPlayer through his BT broadband connection, every evening it would slow down to unsatisfactory levels. Investigating further, he found that the Option 1 package that he was on started throttling speeds to around 700Kbps between teatime and midnight. This is quite a bit under the 1Mbps speed needed for the iPlayer to run properly. The BBC investigated further and found a clause in the BT broadband contract explaining: "[W]e do limit the speed of all video streaming to 896Kbps on our Option 1 product, during peak times only, which is between 5pm - midnight every day." Which is all completely legal, but far removed from the 'up to 8Mbps' speeds that BT advertises to its customers. To be fair to BT, it is well known that bandwidth throttling takes place in the industry, and BT is actually being transparent about it. Even though it did take a rather large nudge from the BBC to admit its hard-to-find speed-limiting clause. BT has hit back saying: "We believe there is a real issue that content owners like the BBC need to address and we are currently in discussions with the BBC executive to ensure that our customers get the best possible experience in the future." The BBC iPlayer is one of the most popular video-streaming services in the UK, and the idea that it and other video-streaming sites are being squeezed through low broadband speeds at peak times is a worrying but truthful one. If video-streaming is to truly take off in the UK, ISPs need to be behind it, not against it. However, this may well mean that the BBC and the like will have to contribute to costs the ISPs incur, as that is all bandwidth throttling really is - a cost-cutting measure.